The 77th treasurer of the Commonwealth of Pennsylvania brings a record of leadership and integrity to Treasury that spans 25 years of public service. Ambassador (Ret.) Joseph M. Torsella was elected on November 8, 2016, and was sworn into office on January 17, 2017. As the treasurer of Pennsylvania, Torsella oversees an office of 360 employees, which protects nearly $100 billion in state assets. The Pennsylvania treasurer or his designee serves on approximately 20 boards on Treasury’s behalf and chairs the Board of Finance Revenue. He administers the unclaimed property program, manages the state’s 529 College and Career Savings Program and safeguards the financial health of the state. Previously, from 2011-2014 Torsella served as the U.S. Representative to the United Nations, for budget and management reform. He was the architect and chief public spokesperson for the Obama Administration plans for reform of the $36 billion United Nations system. Between 2011 and 2014, Torsella advocated for United Nations budget restraint and achieved an unprecedented level of transparency, including webcasting of UN meetings and publication of United Nations audits. Torsella also served as chair of the Pennsylvania State Board of Education. Under Torsella’s leadership, a milestone reform meant to strengthen high school graduation requirements was passed, requiring students to demonstrate proficiency in core subjects such as math, science, English and social studies before they can receive a diploma. Additionally, the Board took steps towards improved school safety and accessibility and affordability of higher education. As Philadelphia’s deputy mayor for policy and planning under then-Mayor Ed Rendell in the early 1990s, Torsella helped develop initiatives to resolve the city’s $1.25 billion deficit in “one of the most stunning turnarounds in the nation,” as stated by the New York Times. 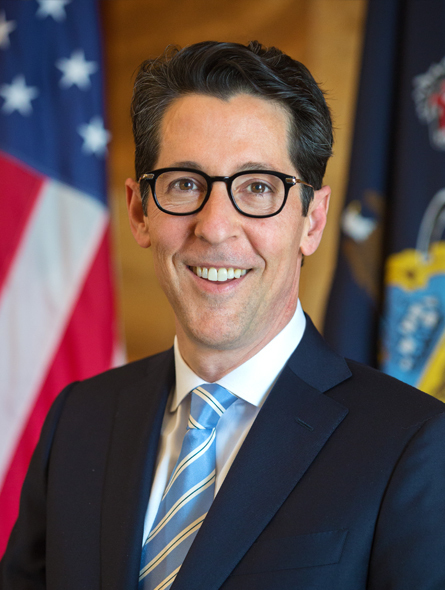 In addition to his career in public service, Torsella served a co-chair of the Greater Philadelphia bid for the 2016 Olympic Games, is a former successful small business owner, has served on several corporate boards and was a Distinguished Visiting Fellow in Public Policy at Drexel University. Torsella has spent his career as a voice for smart policy, fiscal responsibility and public integrity on issues that will shape the future of Pennsylvania. From Philadelphia’s City Hall to the National Constitution Center to the halls of the United Nations, his work is a reflection of his background in public service and leadership, which has earned him a reputation as a voice of purpose, honor and vision. Committed to Transparency and Integrity. Joe’s efforts brought unprecedented new transparency to United Nations operations, and he has already won praise for his proposals to bring new accountability to Pennsylvania. As PA’s fiscal watchdog, Joe will open the state’s books, empowering every citizen to act as auditor. Under Joe’s leadership, Treasury will set the bar nationally as a leader in integrity and transparency. A Record of Leadership and Service. From Philadelphia’s City Hall to the National Constitution Center to the halls of the United Nations, Joe has spent much of his career in public service, delivering impressive results even in challenging environments. Lifting the Fortunes of Low and Middle Income Families. Joe has a vision for Treasury as an engine for creating more prosperity for more Pennsylvanians. As America grapples with inequality and income disparities, Joe is preparing policies to help more Pennsylvania families improve their financial literacy and save for college, steps that can meaningfully change the economic lives of hard-working families. As Deputy Mayor for Policy and Planning, Joe championed reforms that closed a $1.25 billion deficit without raising taxes and led to what the New York Times called “one of the most stunning turnarounds in recent urban history.” He will bring the same drive for efficiency and fiscally responsible management to Treasury. Treasurer Torsella held a joint round table with Keystone Human Services and Susquehanna Service Dogs to discuss how individuals with disabilities can use PA ABLE Savings Accounts to save for the future. Treasury remains committed to developing programming to save taxpayer dollars while offering innovative solutions to issues of concern to Pennsylvanians through PennSEF. They grow up fast. Treasury offers two college savings plans to help prepare Pennsylvania’s young people for higher education. Treasurer Torsella came to watch the Pittsburgh Steelwheelers practice. The Steelwheelers play competitive rugby and basketball. Treasurer Torsella joined Governor Tom Wolf to increase savings opportunities by moving away from Wall Street money managers. Every year, Treasury processes hundreds of thousands of PTRR payments to older Pennsylvanians and individuals with disabilities who apply for the relief. Ambassador (Ret.) Joseph M. Torsella was sworn in as the 77th Treasurer of the Commonwealth of Pennsylvania on January 17, 2017.